A set of documentary materials formerly held as part of the collections of Ms. Masako Yamashita was donated by Ms. Noriko Nakamura on October 13, 2016. The donation of these materials is much appreciated by the Tokyo National Research Institute for Cultural Properties (Tobunken), as the donation reflects an in-depth understanding of Tobunken’s activities, and the materials will be of great importance for Tobunken’s research work. We believe that these materials have an important role to play in Tobunken’s future operations. 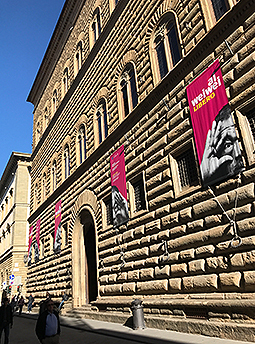 An international conference of art libraries was held in Florence, Italy for three days from October 27th through 29th, 2016. This biennial conference was organized by the Committee of Art Discovery Group Catalogue composed of chief librarians of art libraries in Europe and the United States. This 7th conference attracted almost 100 experts from art libraries throughout the world. The presentations and reports conducted during the session were diverse and fulfilling with a focus on projects for the “Art Discovery Group Catalogue” (http://artdiscovery.net/), a batch retrieval system dedicated to the arts field operated by the organizer, in addition to the latest programs on which such museums of the world are working. The “Art Discovery Group Catalogue” is a retrieval system born from the platform for art bibliographies (artlibraries.net), in which art libraries from 15 countries participated, after its positive dissolution. 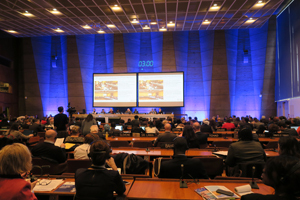 This is a joint international project launched in 2014, in which major art libraries of the world join by using WorldCat (https://www.worldcat.org/) operated by the Online Computer Library Center, Inc. (OCLC), a library service NPO in the United States composed of universities and research institutions of the world. In FY 2016, the Tokyo National Research Institute for Cultural Properties will provide data on papers placed in Japanese exhibition catalogues for OCLC. As a result, in FY 2017, our data will be retrievable with “WorldCat,” the largest joint list of world libraries, and also with the “Art Discovery Group Catalogue” having a partnership with OCLC. Carefully watching the international movements on art libraries and art bibliography information in the future, we will clarify the roles this Institute should fulfill for utilization in research projects. As repeatedly reported through this activity report, the Committee for Salvaging Cultural Properties Affected by the 2011 Earthquake off the Pacific Coast of Tohoku and Related Disasters having its secretariat in this Institute provided rescue activities for numerous cultural properties damaged by the Great East Japan Earthquake in March 2011. The Shochuhi memorial (managed by Miyagiken Gokoku Shrine) standing on the site of the inner citadel of Sendai Castle (Aoba Castle) is one of them. The monument was built to console the souls of war victims related to the Second Division in Sendai in 1902. 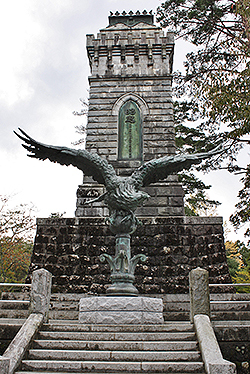 Due to the earthquake, a bronze black kite installed on the stone tower about 15 m in height fell to the ground. Its broken pieces were collected and the main body was relocated as Cultural Properties Rescue Operations by the Committee. After the completion of the Operations in 2014, the Monument was restored as the Disaster-Affected Museum Reconstruction Project in Miyagi Prefecture. The joining work for the broken black kite conducted at Bronze Studio located in Hakonegasaki, Tokyo from FY2015 was finally completed. From October 11th through 17th, 2016, the black kite was installed at its original location in Sendai. 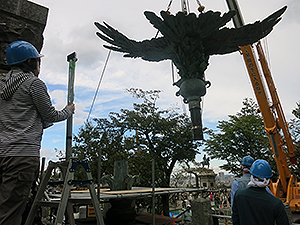 The bronze black kite (4.44 m in height, 5.68 m in width, 3.819 t in total bronze weight), whose original virile appearance with its wings widely spreading was restored in Tokyo after about five and a half years, was transported to Sendai by trailer on October 12th, 2016. On the next day, the bronze statue was installed in the lower front of the stone tower by crane, under the watchful eye of the people concerned, local mass media, and tourists visiting Sendai Castle. The bronze black kite, which had been placed on the top of the tower, was installed at the foot of the tower for security, considering the possibility that it may fall again from the tower top when another large earthquake occurs if placed in its original position. This bronze statue was commissioned, and then produced and cast at Tokyo Fine Arts School (Tokyo University of the Arts, today). Now, you can get a close look at the dynamic appearance of the huge black kite produced with the united efforts of the art school in the Meiji era, although it is now located in a place different from its original position. The restoration process that has taken over a little more than five years has revealed a lot of unknown facts about the Shochuhi memorial. The boring survey conducted in June, 2016 showed that there is a large hollow surrounded by brick walls inside the tower. Another fact that one of the wings of the black kite had toppled over due to an earthquake on November 3rd, 1936 prior to the Great East Japan Earthquake was confirmed with a newspaper at that time. According to the restorers of the bronze statue, the restoration process has revealed a variety of techniques made full use of for production. Particularly, the lead and concrete filling the inside of the statue to fix the rail inserted as an iron core connecting the black kite and the stone tower, as well as to balance the black kite in weight, was removed in this restoration for weight reduction. On the other hand, for installation of the restored black kite, steel pipes with different diameters are connected like inserts are used as a support rod inside the bronze statue. To join the steel pipes, lead was cast to fill the gap for fixing. The fixing method used for this statue clarified during the restoration process was applied to this approach. Thus, the Shochuhi memorial has been revived from the earthquake damage by utilizing the excellent technique of our predecessors. We sincerely hope that this valuable monument in the Meiji era will be handed down from generation to generation for ever after re-realizing the value of new knowledge obtained during the restoration process. 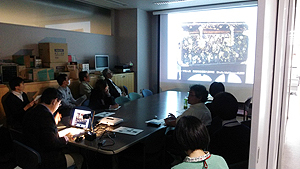 At the 6th seminar in 2016 organized by the Department of Art Research, Archives and Information Systems on October 25th, 2016, Koji KOBAYASI, Head of the Trans-Disciplinary Research Section, made a presentation titled “Japanese Lacquerware Motifs and Techniques Prevalent during the Late Keicho Period to the Early Kan-ei Period – Dialog between Painting Materials and Lacquerware Passed Down” from the perspective of material culture history. At this presentation, he compared and studied the contents drawn in the picture of “Maki-e Craftsman” composing a folding screen depicting various craftsmen possessed by Kitain Temple in Kawagoe City as an important cultural property and the same picture shown in one of Maekawa family’s books owned by Suntory Museum of Art as an original picture depicting various craftsmen of Kitain Temple’s so as to reconfirm the conventional view that these pictures were painted in the early 17th century. Then, he regarded it as reasonable to consider the landscape age of “Kabuki Picture Scroll” and “Picture of Play in the Residence (folding screen of Sououji Temple)” stored at the Tokugawa Art Museum as important cultural properties as the 1610s (between the late Keicho period and the early Genna period) and around 1630 (around the early Kan-ei period) respectively from several perspectives not referred to in past theories. In addition, he pointed out the possibility that you may recognize the living conditions of those days drawn fairly extensively and accurately in these genre paintings. As lacquerware having large vine and wisteria patterns and painted lacquerware using silver powder are often depicted in these pictures, he suggested that these lacquerware patterns and techniques were prevalent in the early 17th century (between the late Keicho period and the early Kan-ei period). He also suggested that the pained lacquerware, lacquerware made for trading with Europeans who visited Japan, and painted lacquerware using silver power with large vine and wisteria patterns passed down to today may be produced in this period. The relation between the contents/expressions of genre pictures in the early modern period and the historical reality is an unsolved issue due to the diverse views posed by scholars in art history and history. During the argument after the presentation of this research, that issue was referred to, leading to active discussion among the participants. On October 17th and 18th, 2016, the Department of Intangible Cultural Heritage held Seminar III on Passing Down Intangible Cultural Heritage (Traditional Technique): “Meiji’s Super-Techniques Handed Down to Today” jointly with SEN-OKU HAKUKO KAN. This seminar particularly focused on Arita ware among the craft works produced in the Meiji period. On the first day, we organized a lecture and a session while on the second day, we visited the exhibition titled “Meiji Kogei: Amazing Japanese Art” held at the University Art Museum, Tokyo University of the Arts, and the exhibition of “Arita Porcelain 400th Anniversary: The Compelling Beauty of Arita Ceramics in the Age of the Great International Expositions” at SEN-OKU HAKUKO KAN. In recent years, there have been several exhibitions that have attracted attention for elaborating on the techniques used for artifacts in the Meiji period. We can access “Craftsmanship” = “Intangible Cultural Heritage” through the artifacts of the Meiji period that have been handed down to the 21st century. We think researchers should not separate such cultural properties into tangible and intangible ones but should regard the two as complementary from now on. The Department of Intangible Cultural Heritage will continue to provide debate opportunities to increase interest in today’s intangible cultural heritage. The Baird’s beaked whale specimen (Berardius bairdii : nickname “Tsutchy”) exhibited at the Rikuzentakata Sea and Shell Museum is a whale (total length is about 10m) that was stuffed to celebrate the meeting of the International Whaling Commission in Tokyo in 1954. The specimen was damaged by the great east Japan earthquake and tsunami on March 11th, 2011. 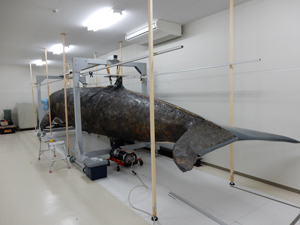 After the primary inspection of damage at the museum on May 28th, 2011, the specimen was transferred to the Tsukuba Research Department of the National Museum of Nature and Science on June 30th, 2011. Currently, the project for restoration of the specimen is in progress. 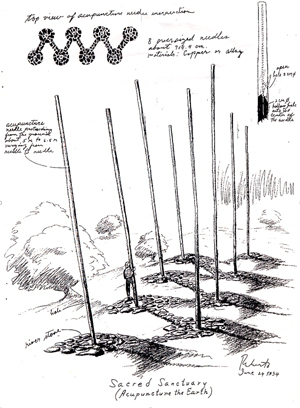 In this project, it is important to understand the structure of the timberworks and the location of corroded nails inside the specimen. At the request of the National Museum of Nature and Science, Masahide INUZUKA and Midori HAMADA investigated the inner structure of the specimen using X-ray radiography from October 16th to 18th and from 23rd to 25th, 2016. For this research, we used the developing equipment, which is dedicated to imaging plates that were introduced to our institute in 2015. Accordingly, we proceeded with the research by confirming the X-ray transmission images each time they were obtained. To investigate the overall inner structure of the specimen with the total length of about 10m, we obtained 375 X-ray images in total. The information about the structure of the timberworks and the location of corroded nails inside the specimen obtained from these X-ray images will be referred to during the investigation using an endoscope and the restoration works. From September 26th through October 6th, 2016, we visited the Republic of Armenia and the Islamic Republic of Iran in order to grasp the need for cooperation in cultural heritage protection. Regarding Armenia, the first visiting country in this time, the cooperation agreement has already concluded with the Ministry of Culture in Armenia. We jointly conducted investigation/research and conservation/restoration activities for archaeological metal materials with the History Museum of Armenia as our counterpart from 2011 through 2014. During this visit, we visited the Ministry of Culture, the History Museum of Armenia, the Etchmiadzin Cathedral Museum and others again to consult about the development of future projects. 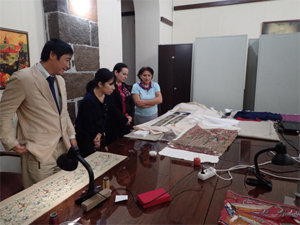 We are planning to cooperate with Armenia in technological transfer in the conservation/restoration area for dyed and woven fabric works. Then in Iran, we mainly visited the Iran Cultural Heritage Handicraft and Tourism Organization, the Research Institute of Cultural Heritage & Tourism, and the National Museum of Iran. Air pollution issues were often referred to during the discussions with Iranin experts. At present, air pollution is a seirous social problem in the capital, Teheran. During the consulattion, they pointed out the possibility that this serious air pollution might affect items exhibitied or stored at musums. We are considering joint research on such issues for improvement of exhibition and storage envrionemnts in Iran.